I don't remember exactly how old I was or what grade I was in, but I recall some time in junior high reading "Night of the Twisters" as a required assignment in English class. 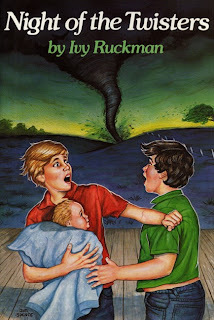 That book scared the crap out of me and I was born in Oklahoma, the most dangerous lane in Tornado Alley. You learn very quickly what the sirens mean and what the drill is. But something about that story - the frantic urgency, the desperate need to know, the dark night filled with screaming monsters of nature - it embedded itself in my mind and is what I recall every time a tornado touches down. What happened down in Moore is beyond tragic, it's the worst kind of awful because there is nothing you can do to prevent it - there's not really a step you can take to stop the beast bearing down on you from the skies. Maybe if you hadn't waited one minute more, maybe if you'd turned right instead of left, a lot of maybes that get lost in the 100-mph winds. Because those are innocent actions. This isn't the grand scheme of a people influencing another to take action years later and plant a bomb or fire a gun in vengeance; this is the force of nature and it leaves you feeling helpless and small. I don't pray, but I am thinking about Oklahoma. And I am writing again. That's a really, really good thing. The story is forcing itself into my mind more and more, invading my showers and drives home. So we're about halfway through book 4. I know that's not the progress you hope for, but it's a hell of a lot better than where I was last week, not even bothering to open the word document. I don't know if I want to post any more teasers. A reader said he was resisting reading them so as to not spoil anything. I don't want to spoil anything, either, so if I do tease a bit, they will be few and far between. Anyway, off to bed for the night.